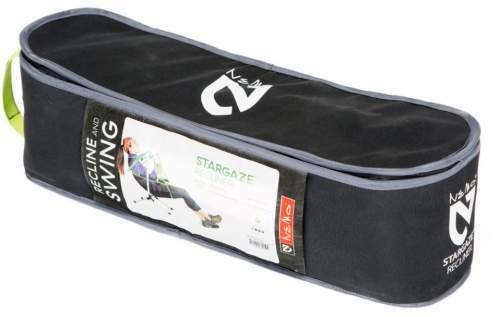 Nemo Stargaze Recliner Chair is a unique design with swing and reclining features, a nicely packable and backpack-portable camping chair. Nemo Stargaze Recliner Camping Chair. 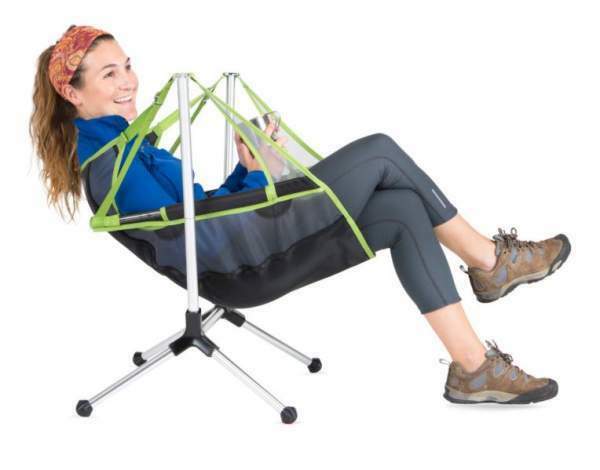 This Stargaze chair is available on Amazon. Currently this seems to be only in the US store, but this may change later. So the link will redirect you to your local Amazon store, if you are lucky you might find it there. The Nemo Stargaze is the first ever swinging and reclining camp chair and this is a patent pending design. Nemo has built three swing chairs of this type and the chair presented here is in the middle (by size). So there is also the Luxury Chair in this series and the Low Chair. The latter you will see it in the same link on Amazon. This is a swing design. You have two poles on the sides and the seat hangs in the middle. 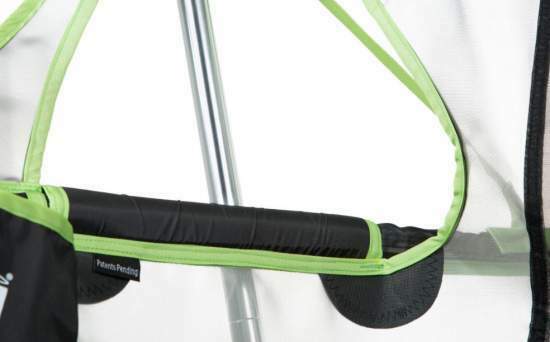 So this gives a relaxing motion, it is designed for comfort and it works on any surface, including rocky, sandy or uneven ground. The chair is also with a recline system. Simply lean back to activate the auto-reclining mechanism and this is it. Here you have an automatic reclining system. But this is a collapsible design that packs nicely. This also implies that it needs a simple assembly, without any tools of course. 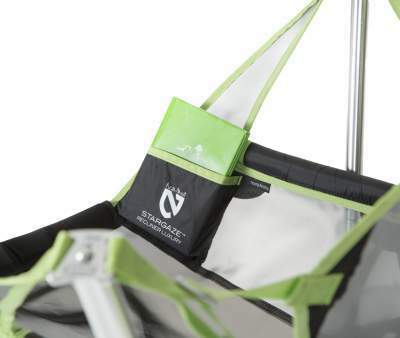 I have included it in my list of the best collapsible camping chairs. 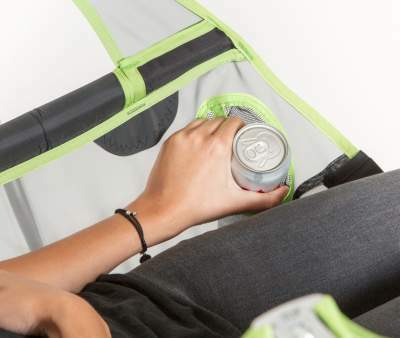 The chair comes with an integrated no-spill cupholder which keeps your beverages close at hand. You also have a stash pocket sized for tablets, keys, books, or phones, see the pictures. A padded carry bag is included. They use a non-absorbent monofilament mesh which is cool and breezy, they claim that it resists bacteria, withstands sun exposure, and it doesn’t retain water. The chair is supported by an aircraft grade aluminum suspension frame and the tubes are exceptionally thick as you can see in the pictures. But note that it is designed to flex while you swing so do not think this is a structural weakness. Note that you have only two elements here plus the carry bag. All the tubes are shock-corded and permanently attached to each other so you cannot lose any segment, and the seat is one single piece. It is easy and intuitive, all is done in three quick steps, you will see this in the video below. All the colors of the Nemo Stargaze Chair. Capacity-wise, the chair is able to support the weight of up to 300 lb (136 kg). The same capacity is in all the chairs in this series, you will see them in the comparison table below. Weight-wise, with 5 lb 11 oz (2.59 kg) of the weight and a nice packed size this is a backpack portable chair. But this is not a backpacking chair, if you need one please check my separate list. 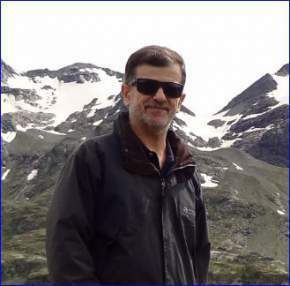 Size-wise, the dimensions are (W x D x H) 24 x 36 x 35 in (61 x 92 x 89 cm). So these are great numbers but note that you do not have a headrest here. If you want it, better take their Luxury Chair from this series. So this is a camping chair, a chair to take to the beach, for tailgating, for your backyard and you name it. Weight: 5 lb 11 oz (2.59 kg). Dimensions (W x D x H): 24 x 36 x 35 in (61 x 92 x 89 cm). Packed size: 23.5 x 6 x 6 in (60 x 15 x 15 cm). So this Nemo Stargaze Recliner Chair is an ingenious design and the craftsmanship here is at the highest level. This chair looks great regardless of where you use it. It is reliable and comfortable, but this comes at a price. Please note that this is not a sponsored text and I am not paid by the brand. 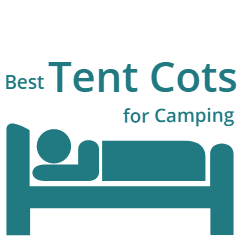 If you still need more options, check in the category Camping Chairs here in the site, you will find them in hundreds. Thank you for reading. Do use the comment box below if you have a question or comment. Please share this text if you find it useful.